It was cold. The only room without heat, the only room where everything happened. I lay still as I hear the whispers, I see the shadow pacing in front of my bed. Terrified of what it might do what it can do, I am frozen. I start to doze off. I can’t keep my eyes open anymore it’s been two days since I refused to close them after what happened on the night of the full moon. My name is Lia i’m fourteen and I’m afraid of what’s in my room I’m afraid because it doesn’t leave my room and it’s always waiting when I get back. I have a family of four a little brother named lucas and my parents. There is something in my room. Attached to it, attached to me and it hasn’t left me alone since I first saw it. My escape is leaving but at some point I have to come back and when I do I feel its presence. The black shadow with a face of scars it hovers over my shoulder and tries to talk, but I can’t understand it. What does it want? What will make it go away? Two nights ago it was a full moon. That is when it first started. Earlier that day I had come home crying because I was told that my 14 year old german shepherd, Max, passed away. He was my best friend. We grew up together and now he was gone and I didn’t get to even say goodbye. Full of sadness and anger at the world I sat on my bed in the dark and cried not knowing what was there in the room with me. Then in the night I awoke to a noise, a voice and footsteps. I was so scared I didn’t dare move. I didn’t know that I could nor that I wanted to. I didn’t want it to know that I knew it was there. Then I finally got the strength to shoot up and turn the lamp on top my bed stand on. I grabbed my phone and ran out the door to my parents. Of course, I didn’t tell them what really happened. I almost had a heart attack thinking about it, how was I gonna say anything? So I told them that I heard a noise downstairs and I asked if they would go take a look and as I already knew, there was nothing down there. Now two days later at four in the morning I am with my eyes wide once again. The shadow watching me and I it. 10 a.m. I’m going to do some research today. Maybe I’ll find something that will help me figure out what this is and how to get rid of it. After hours of digging I’ve narrowed it down to two things, a poltergeist and a demonic ghost. 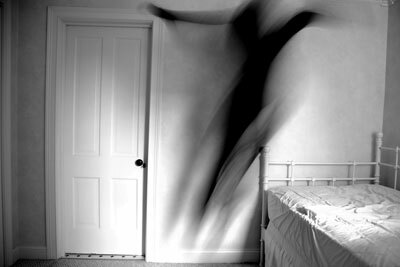 A poltergeist can move things and is created by anger and fear. They are very aggressive and being very frightened is what keeps them attached and a demonic ghost is a human like figure that is dark and demon like but very intelligent. I’ve been looking for ways how to get rid of this “non living” being and I found some. After all the research I know that what this being is, is a poltergeist. It says that they are created by anger, grieving, fear, and continuous thought or doing of something toxic. Toxic things that are attached to you can feed it and make it stronger. It is a theory that since the more energy it gets and the stronger it gets that it will be able to create more poltergeists on its own. I read that if the poltergeist is there and has been there for quite some time than you still have a problem with yourself that you need to fix so it can stop feeding on the negatives. Once it has weakened it is a good idea to “bless” your house and that should work. But of course I can’t bring a priest in or anything like that. Now almost three in the afternoon I’m heading home. I walk in the door and my brother Lucas runs to give me a hug. After that I immediately hear my dad yell at me to not leave anything by the door and to take all my stuff upstairs to my room because he just got done cleaning. He stays at home with my brother while my mom works so I should’ve expected to come home to demands. I take a breath and walk toward the staircase and suddenly i’m stopped by a figure standing in front of me. The only thing I can see is the outline of it, It stands like a human and has the shape of one. I wonder if it would look like one if its body had color. Then I look at the stairs and walk straight through it feeling and energy like none before. I rush to put my stuff down in my room and grab everything I need until the night, and as I walk out searching behind me for what only can be seen in the dark I get goosebumps and leave the light on. My mom yells goodbye and her and my father walk out the door, they’re going to visit my grandpa in the hospital but they don’t want Lucas and I to see him in such a condition so I’m stuck at home. I found something good out of it though, I’ve gone to the store to get saige. I read that it protects from any negativity and forces anything negative away. I light the stick of saige on fire and walk through the house for about twenty minutes. By then it was all gone and I felt more relieved that if it worked, I might get some sleep tonight.